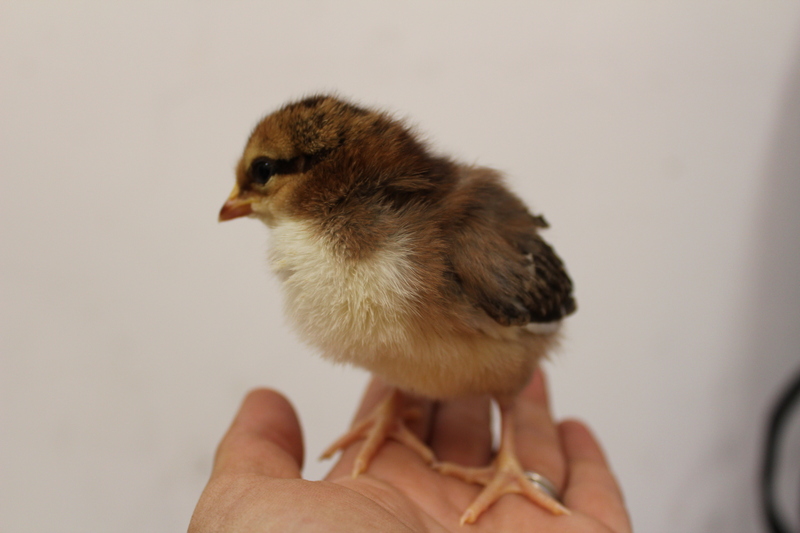 I’ve been hesitant to name the chicks thus far as I’ve heard from multiple people that bad things can happen to your chicks. According to Jason Price at Modern Farmer, “At least one of your chickens will die a horrible death”, via random disease, predator attack, or in his case, dog-he-was-pet-sitting-attack. If you know me, you know I get attached, and fast. So, for these first few days, I’ve tried to remain emotionally unattached, which I’m failing miserably at. Without further ado, I introduce you to the first two chicks I’ve named. 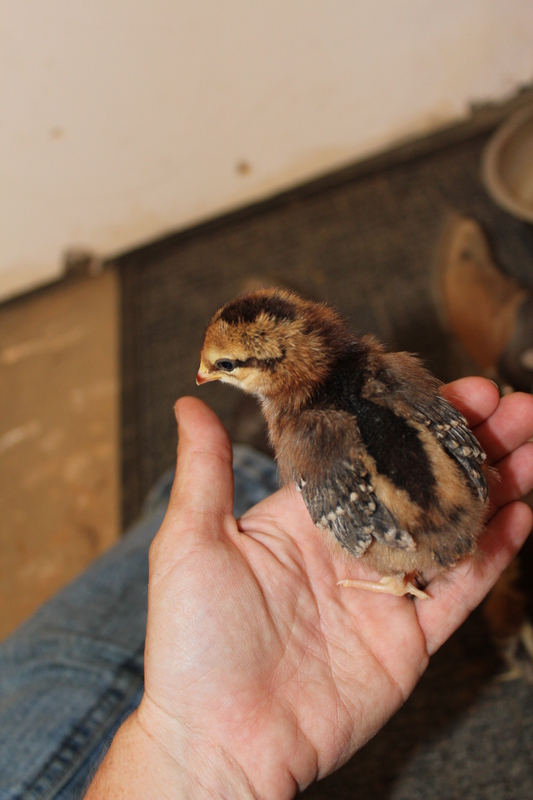 Meet Legs, my six-day old Feather Legged Cuckoo Maran. She will eventually lose all of that black down and develop black and white speckled feathers. She’s a bit different than the Brown Cuckoo Maran you will meet later, in that she has feathered legs (hopefully you caught that already from the breed name). You can see them starting to grow in the picture. Thus, the name Legs. I can’t wait to see what she looks like when she gets older! Meet Chip, my six-day old Welsummer. Her full name is “Chipmunk” because she very much looks like a chipmunk when you look at her from the top down. She is very similar to the Speckled Sussex… in fact, I had to do some research to be able to tell them apart at this point. 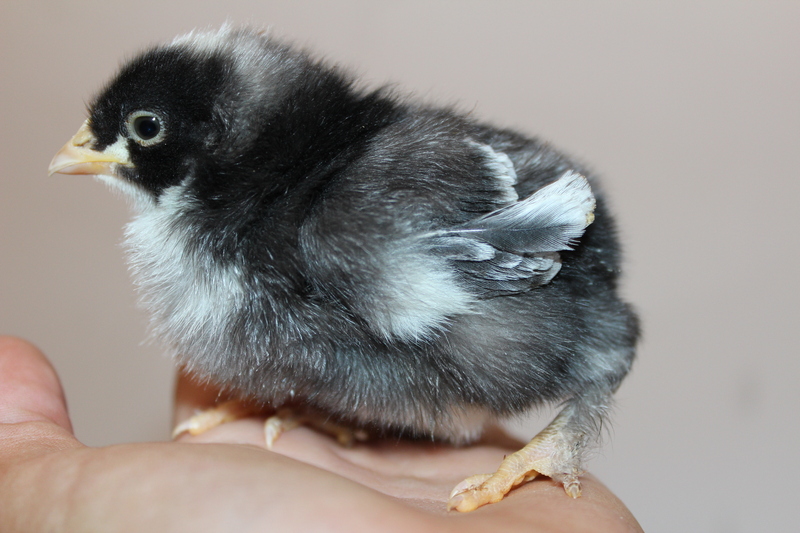 The key differentiation seems to be the legs… the Welsummer has pinkish legs while the Speckled Sussex has yellowish legs. You learn something new every day! You’ll get to meet two more tomorrow!